For two weeks, I have been revising and editing a post on my VSC story, and just today I decided to throw it out and start fresh. My laptop has just given me a warning that it has a low battery, which makes sense because I’ve been on it all day. I’ve been stopping and starting this post as I receive emails on VIP mailings, meetings, and meal donations. I also just fell down the stairs in my house, resulting in me typing most of this one-handed as I ice my other hand to reduce swelling. A day in the life of an assistant producer, I guess. I never expected that I would end up in this role for the VSC, especially not when I first applied for the internship program in 2013. To be completely honest, I applied because my high school required a project called Graduation Challenge where a senior needs to complete 70 hours of doing something they’ve never done before, write the longest paper of their academic life on it, and give a ten-minute presentation on it, or else they won’t graduate. Most seniors do something like yoga or writing a blog, but those weren’t options for me because my brother did yoga and my sister did writing a blog. So, I went with the first option I got that actually interested me: a piece of paper handed to me by my acting teacher, Robin Fawcett, advertising for an internship program with the Vermont Shakespeare Company. Yup, I joined the VSC so that I could graduate high school. Kind of a selfish reason, I know, but if junior year Zoey had known how much this experience would change her life, I don’t think she would have had the courage to apply. I expected to have an amazing learning experience. I didn’t expect to have an amazing living experience. I expected to gain connections. I didn’t expect to gain friends that I will have for the rest of my life. But then again, if there’s anything I’ve learned about life, it’s that things don’t always turn out like you expect. Having just came out of my first year of college alive, I think I’m entitled to say that freshman year is one of the hardest years of a person’s life. At least, it was for me. When I first went to Drew, I knew nobody. Barely anybody on my floor knew where Vermont was, so I was known as “the girl from Canada” for the better part of a month. I felt lost trying to establish connections in a brand new place. Then, one day, I saw a VSC cast member on campus. We didn’t talk for long, but just seeing him gave me new energy. I remembered who I was and that I had a group of people who loved and supported me not because they had to or because they were my blood, but because they chose to. That year, through headaches from studying, muscle aches from stage combat, and heartaches from bad decisions, (pains I now know I had to have to make me who I am today), I knew who I could rely on to remind me of my heart. I didn’t expect to change so much over the last year. I don’t think I’d recognize my current self if I’d met her a year ago. I definitely didn’t expect that I would change my major from Theatre to Art with a concentration in Film. Most of all, I didn’t expect that in one of my hardest times I would write the VSC and ask to intern again this summer. 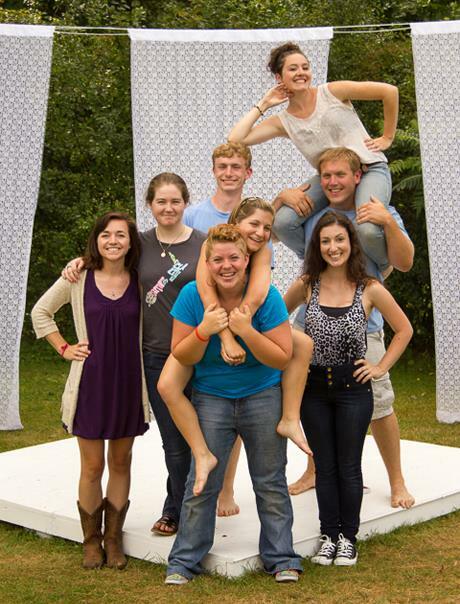 I thought maybe I would have moved on like the rest of my original 2013 intern team known as The Fellowship. There were nine of us and we each had a nickname from The Lord of the Rings. Mine was Frodo, for the obvious reason that I’m 4’11”. But perhaps it was for another reason. Perhaps it was because Frodo was the one who had to see the mission through. Sometimes I wonder what I’ll do without the interns I have worked with in the past, especially the three that have been with me for two years. Who will set up the lighting for our outdoor locations instead of Alzi (Legolas)? Who will put up the draping around the pavilion at Knight’s Point State Park instead of Charlie (Sam)? And I know I will have to make sure everything goes to plan during mod pack up and keep all the interns in check instead of the incomparable Xoe (Gimli), but for once, I don’t know what to expect. And I don’t want to. This summer, I want to stop expecting and start living. I hope to pass on the reigns of intern to a deserving and passionate individual, then leave the Shire and journey on to my next great adventure. Posted by Jena Necrason, Artistic Director. There is so much to share. There is so much to worry about. And joyfully there is much to celebrate. Our designers are amazing. They have continued to bring wonderful, evocative ideas to the creative table. We are working with a unit set for the first time. This means the set is built in pieces that fit together and can be put up in each of our 3 performance venues. The set will travel in a truck. Becky Bodurtha, our Costume Designer, (this will be Becky’s fifth year designing costumes for us), is hard at work on a style that is a “mash-up” of both modern and Elizabethan elements. I am grateful for the tour de force that is Gregory Ramos, Chair of the UVM Theatre Department. Gregory has worked extremely hard to make the collaboration between Vermont Shakespeare Company and the theatre department a reality. As John prepares to direct the show, ideas and images are flowing. Our house is a place where at any moment a theatrical idea can erupt and interrupt a regular every day activity. This happens much to the chagrin of our almost-6-year-old, who sometimes loves it and often is annoyed by it. In preparing to play the Nurse in the show, I am currently at the stages of “text analysis”. A process that while sometimes tedious, is incredibly enjoyable for me. Plosives, antithesis and feminine endings, oh my! Taking a break from my Artistic Director hat to dive back into the process of being an actor is certainly something for me to celebrate. The last time I performed with the company was as Ariel in The Tempest in 2012, truly one of my favorite roles to date. Primary worry- CAN WE GET IT ALL DONE? Thankfully we have the talented Zoey LaChance as our full time intern this summer, in the role of assistant producer. How will attendance be this season? We rely so heavily on ticket sales. Marketing initiatives are a daily focus. Another worry- how will we survive this year without Xoe Perra (Intern Team ’10, performer ’12, Intern Team ’13, performer ’14) and Mark Roberts (company member since 2008). Both are working on other projects this summer and we will miss them dearly. So, what to celebrate…well the fact that Vermont Shakespeare has survived for a decade is surely the biggest thing. In the world of non-profit theatre, this is huge. And the fact that we have a stellar cast lined up for this show is another thing to celebrate. And finally, it can’t be left out that we live in Vermont (full-time!) now. I am thankful for this on a daily basis. The stunning beauty of this state is a constant reminder of how lucky we feel to be doing what we love in a place that we love. Stay tuned for more blog posts from cast and crew, coming soon.